With Egmont's new edition of Peter Pan popping in to bookshops last month, and my recent post about the behind-the-scenes processes of illustrating the cover, I thought it was about time I shared this nice dollop of inspiration with you. 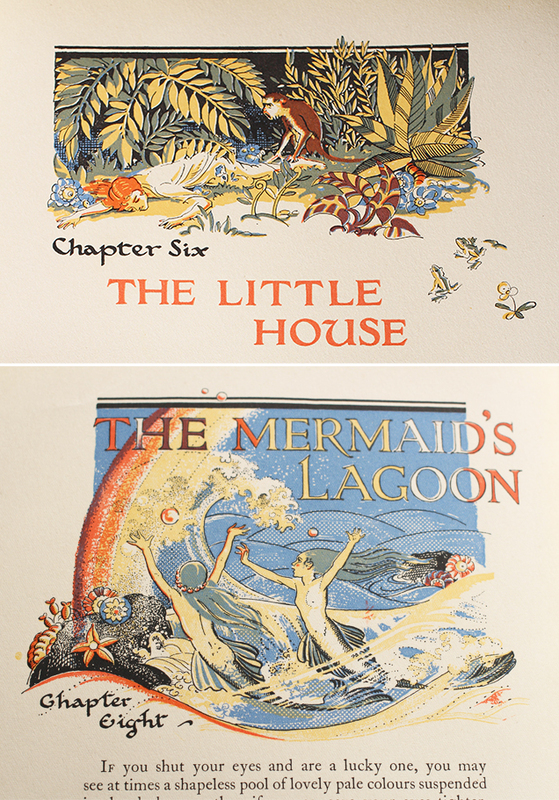 This edition of Peter Pan and Wendy is from 1931 and illustrated by Gwynedd Hudson. It's falling apart a little bit, it's got that gorgeous old-book smell and the illustrations are beyond beautiful. I spent most of the afternoon carefully going through each page and taking photos of all the interesting bits of illustration (I can't feature them all here, there are so many!) to make sure they're preserved, to share them with you and to use as a little catalogue of inspiration for when I'm home! Although my book cover and illustration style followed a completely different path, it was so inspiring to see this take on the Neverland world whilst in the depths of working on the project. I particularly love the really clever use of colour layering when working with a limited colour palette. It took me back to all the figuring out I had to do whilst arranging an illustration for risograph printing! Each chapter heading is so dynamic and captures the essence of the story. There are loads of tiny spot illustrations dotted around the margins as well, which are really lovely to see as you read through; it immerses you in the atmosphere without being too visually prescriptive. I adore old books (and, well, books in general obviously) and collecting inspiration from vintage illustration. It's definitely a great find by my Mum, I'm so glad she rescued it and kept it safe! I'll be posting more of my vintage book illustration finds soon, so keep up with it on Illustrated Life or by following on Bloglovin here. Exciting Small Business 100 Feature!